Happy Thursday!! Lately I’ve been wearing a lot of black and neutrals, so I decided to branch out with this bright yellow sweater. It’s the perfect way to brighten up my day and wardrobe! I can’t wait to wear it more as we transition into spring with white jeans!! 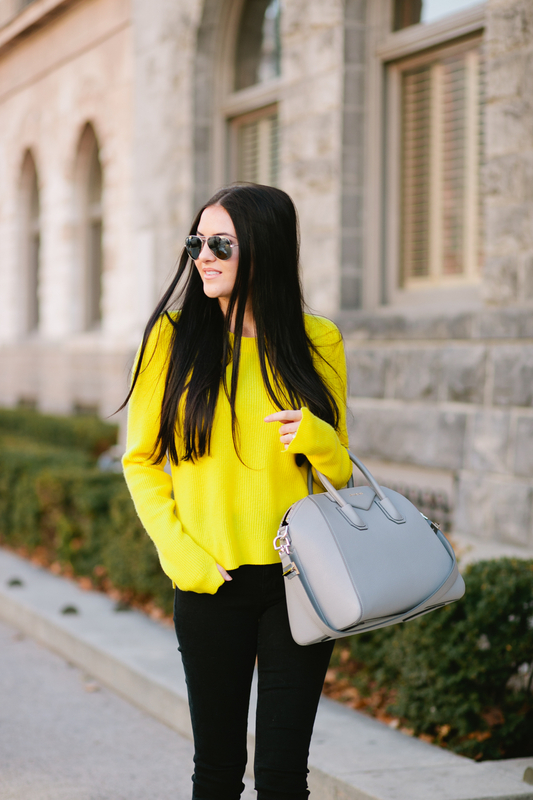 This bright color sweater could not be any more perfect for the winter dreariness! You look so great! Thank you, Tess! You are so sweet! Bright yellow really is your color! You look absolutely amazing. Tou wear this simple outfit very well. I love the boots with the black pants. Love this post! I miss your brights and neon looks! Cute outfit! Love the pop of color. I’m not normally a yellow person, but I love how you paired it with all black. SO perfectly edgy and sleek! Love your sweater! Thank bag is beautiful too! Such a nice break from the gray winter days! Your sweater certainly brightens up the mood! That’s exactly how I felt! I was just so tired of grey and black so I had to switch it up! You really bright in this lemon sweater!!!! Bright is right!! But I love it with the all black! It looks awesome!! Thank you!! My sisters keep telling me I should cut it, but I just can’t do it! Thanks for following along! This makes me want to get a yellow top too! Love how seamlessly the boots meet the trousers! Oh I absolutely adore this sweater! The bright colour is perfect, and I love it with the black, but you’re right, white jeans in spring would look gorgeous! Love this canary yellow on you! You’re rocking this bright color! 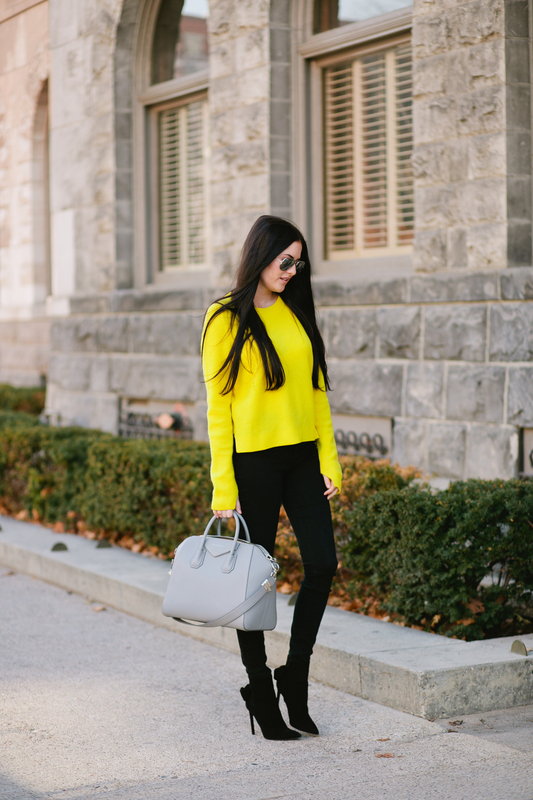 Love the yellow sweater & bag!! ? I love the way you do brights girl, keep rocking color! Thank you, Charlotte! You are so nice! I’m obsessed with that pop of color, sweater! Perfect inspiration for spring. That pop of yellow is everything! It was a little out of my comfort zone, but I ended up loving the color! Thanks for following along and confirming my doubts! Loving the bright sweater it looks fantastic! Nothing Beats a little Colour to cheer you up on a chilly morning.